From 18-20 March 2019, some 45 education managers and executives from Haiti’s Departmental Directorates of Education (DDE) met at the Ministry of National Education and Vocational Training (MENFP) for a workshop on conducting diagnoses of the education system at the departmental level. With financial support from the European Union, this workshop was part of the IIEP-UNESCO project to strengthen the Haitian education system. 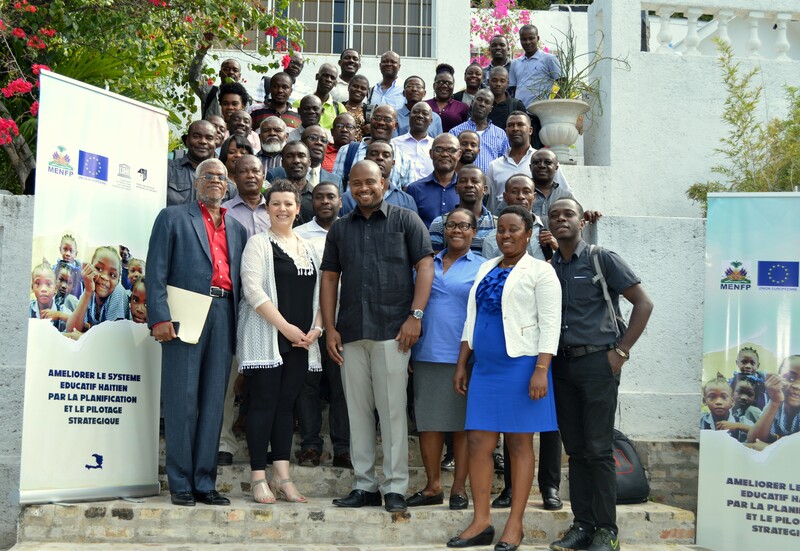 The participants – with varied profiles from across the ten geographical departments of Haiti – actively participated in the three-day workshop. The main objective was to determine which indicators – based on the available data – should be used in the education system diagnoses of each DDE, an essential first step in planning. The overarching aim of this project is to enable the DDEs to become more involved in the planning and management of the education system at the departmental level. As the DDEs are closer to schools and are strongly connected to the local communities, their responses to the educational challenges are more relevant and in line with the reality of the whole department when they are fully involved in this process. "Developing the capacities of the DDEs will not only be based on training sessions, but on technical support for each DDE through the use of coaches specialized in educational planning. This will allow participants to directly apply the training to their daily realities," said James Logiste, an Education Programme Specialist at UNESCO's office in Haiti. This approach is shared and strongly supported by Yves Roblin, Director of Planning at the Ministry of National Education and Vocational Training. The workshop, which took place under the leadership of IIEP expert Stéphanie Leite, stressed the importance of using existing data for planning and managing purposes in the DDEs and explored the database for the diagnosis of the education sector by calculating indicators on access, participation, and equity in the education sector of the DDEs. In addition, this practical workshop follows a first session during which DDE officials discussed the theoretical aspects of education in Haiti. Their mission was then to investigate their respective departments: to collect information, data from the sector, and work together to produce reliable and accurate analyses based on the collected data. The teams from the MENFP and IIEP-UNESCO are now preparing for follow-up workshops, which will focus on drafting of the first set of departmental diagnoses of the education sector. A group photo of the participants during the workshop.